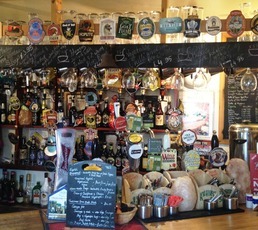 Selection of real ales, but not kept very well. Guinness shooters are good.Thursday night seems to be kareoke night. Had a very nice home cooked lunch here last week. Good value, pleasant bar staff and good selection of drinks (see photo). Good choice for vegetarians. 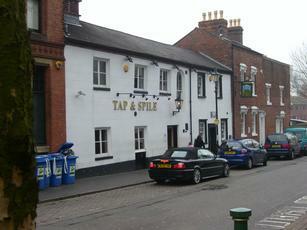 It's the best traditional real ale pub in the immediate locality, though becomes very noisy and crowded. Getting served and negotiating the different levels, narrow passages etc. can make getting rounds a chore, and I've had a more relaxing evening to be honest. 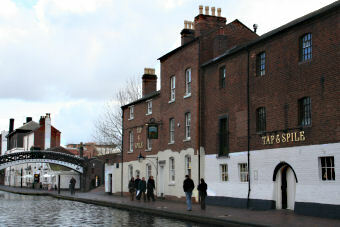 Down to earth and cosy pub nestled by the canal, one of very few places in Birmingham I've found which sell the beers you get in London (Fullers Pride, W&Y Bombardier - there is also TT Landlord). Cheap too, £2.80 a pint. A good place. 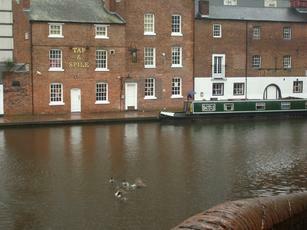 This pub looks closed from the canal side. However, persevere and you'll find an open pub that can be entered from the road. There's a decent number of real ales. But on our visit, they were all fairly standard - Jennings Sneck Lifter & Cocker Hoop, Wychwood Hobgoblin, Greene King IPA, Theakston Old Peculier, Timothy Taylor Landlord & Wells Bombardier. Addlestones is the cider. 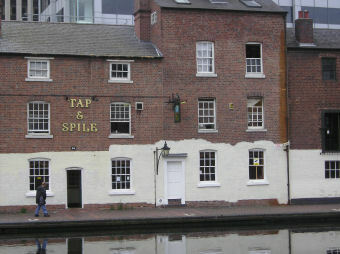 I don't think this pub makes the most of its location next to the canal and as others have said, the interior is quite worn.